7 great piano duets to perform at a recital, play-for-fun, or sightread! 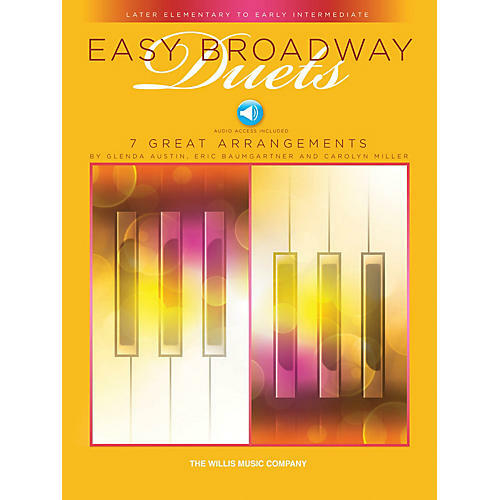 These popular Broadway hits are appropriate for any age and have been pared down to their essence and wonderfully arranged. In addition, online audio files of the Primo and Secondo parts are available to download or stream if your favorite duet partner is unavailable! A demo track of both parts together is also provided. Titles: Close Every Door (Joseph and the Amazing Technicolor Dreamcoat) · Happiness (You're a Good Man Charlie Brown) · I Whistle a Happy Tune (The King and I) · Matchmaker (Fiddler on the Roof) · On My Own (Les Misérables) · Phantom of the Opera · The Sound of Music.